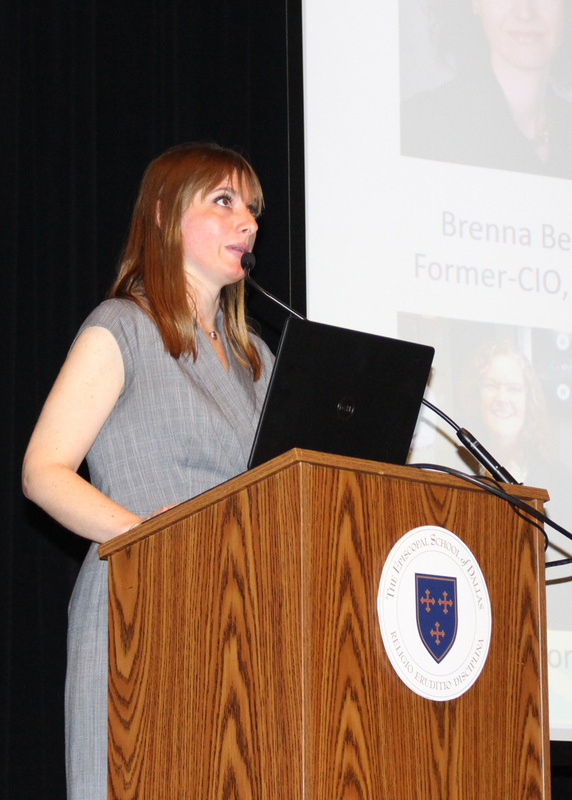 Yesterday during Special Programming Day, juniors and seniors had the incredible opportunity to hear from Jennifer Sanders, Executive Director and co-founder of Dallas Innovation Alliance, as part of the annual Robert H. Dedman Endowed Lecture Series for Leadership. Ms. Sanders, who was introduced by Student Council President Annie Sawers, spoke to students about the impact of smart cities and how Dallas is helping lead the way in the United States. After moving to Dallas from Washington D.C. in the early 2000s, Ms. Sanders began her career in public relations and change management consulting but felt called to civic engagement in Dallas. She joined the Mayor’s Star Council, a group of young professionals interested in improving the city of Dallas and becoming more engaged in our city. Ms. Sanders and DIA's co-founder identified the need to make Dallas a smarter, sustainable city and pitched the idea to the Mayor in 2015. That conversation launched the Dallas Innovation Alliance. The presentation reflected Ms. Sanders' career journey to having expertise in a subject area that didn't previously exist and focused on how smart cities positively impact economic development, efficiencies, equity, education, and exposure. Relevant examples included solving rat problems in Chicago, helping with asthma in Louisville, and offering access to technological backbones in underserved areas. Other innovations, like "The Edge" - the world's most intelligent, greenest building, traffic lights responsive to traffic flow rather than timers, and autonomous vehicles, intrigued the audience. She explained that DIA's Living Lab serves as an incubator of new applications, providing real-world data to improve offerings and experience. She also remarked that through a very strong public/private partnership, Dallas is helping lead the way in the United States. And, there's more to grow. After her talk, students had many questions ranging from the application of technology to data security and privacy concerns. Ms. Sanders inspired many with her experiences changing career fields, working as a woman in the tech field, and being a part of a movement that brings people together to solve challenges and improve urban living. Started in 2002, the Robert H. Dedman Endowed Lecture Series provides students opportunities to learn lessons in leadership from outstanding achievers across many industries. Guests have included captains of many industries, heroes, and champions of philanthropy and service. For more information, please contact Carol Bergman (bergmanc@esdallas.org).